I grabbed the 7 speed cassette and drilled the rivets out. Unstacked, this is how the pieces look. This means I can mix and match them! Since I am using a 28 tooth and a 14T, I only need those two and the small one that interlocks with the lockring. So I measured the stack of the others and made a spacer from some PVC pipe. I also made a spacer to hold the bearing in place. I added some bearing balls and a cone, and slapped it together. The big problem there was that there was not a lot of room there, so I grabbed a die and cut some deeper threads on the axle. Yay! Taps and dies are strangely satisfying for me. I reassembled the hub and tried it in the frame. Unfortunately the over locknut dimension of the hub is too wide for the frame. I can't make it any narrower, so I'll have to get the frame's flanges widened. I think when that happens I'll have them lowered as well because the wheel is a little difficult to install. I'm very close to having this thing ready for welding. I think I have a pretty good road map right now for FINISHING this machine. We settled upon using a freehub drive system. 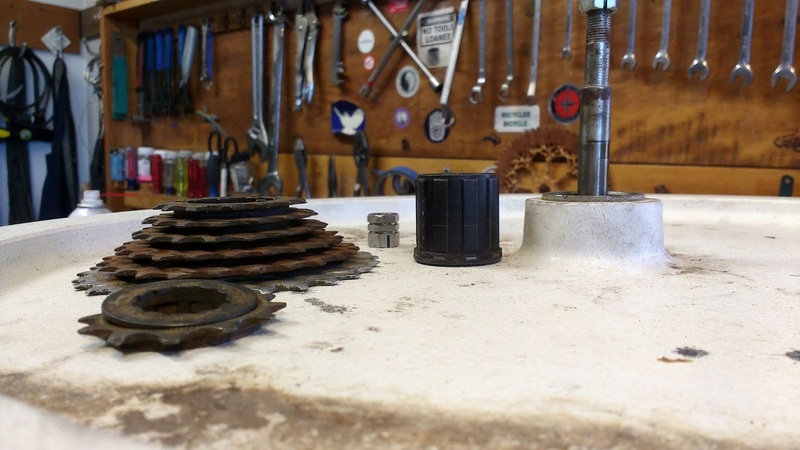 This differs from a freewheel in that the latter keeps its ratcheting system in the cogset, and the freehub (aka cassette) has the cogset slide onto a ratcheting "freehub body" on the hub itself. 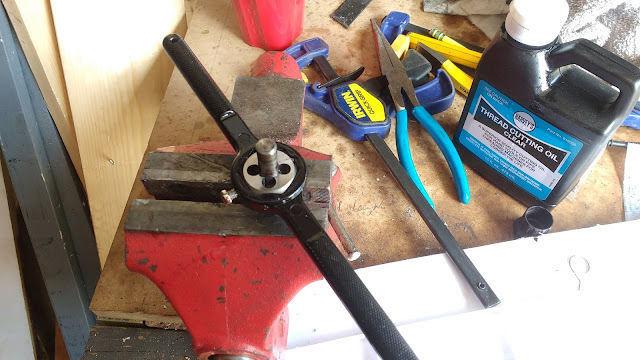 We settled upon welding a steel freehub body (black, at right and in below photo) to the flywheel hub. 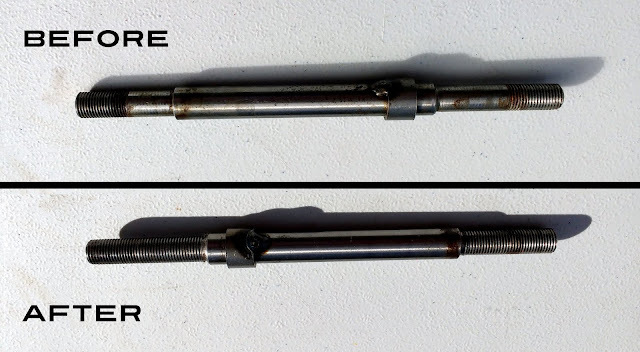 This has splines that the cassette (left) slides onto. 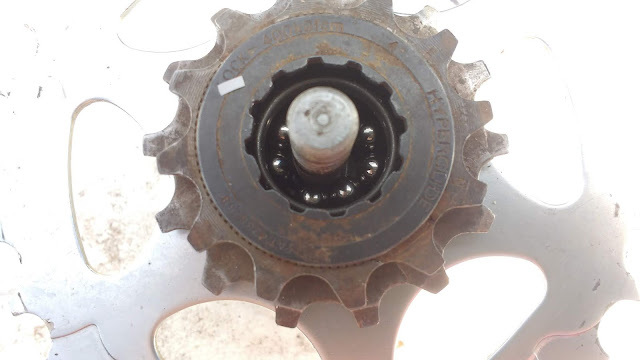 Then the smallest cog (lower left), slides over the end of the freehub body and the lockring (sitting on top of this cog) threads into the freehub body, securing everything together. Needs to be welded on! 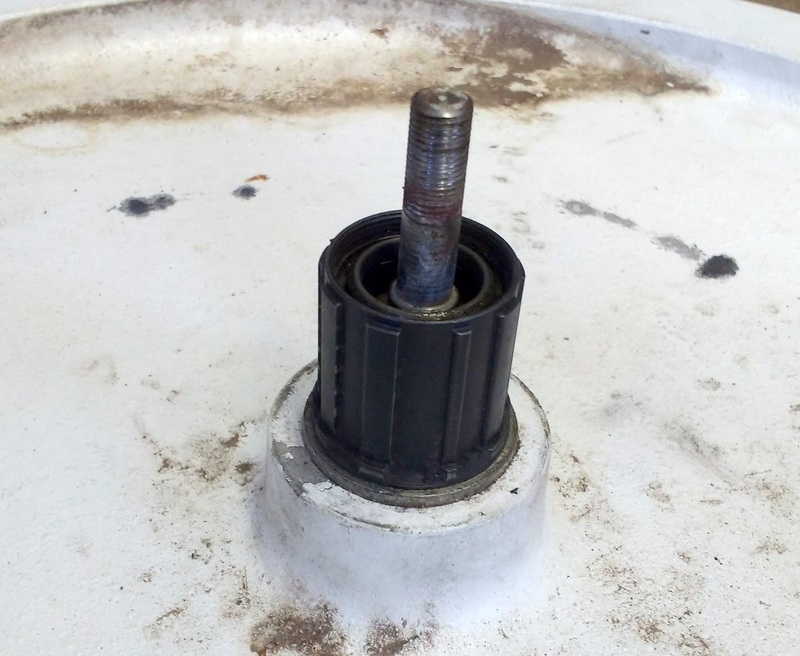 This will solve the problem I had last week of the small cog threading itself off. Since the freehub cogs slide onto fixed splines and are held on by the independent lockring, excessive force in either direction is not going to mess with the drive train. I will also be drilling out the rivets that hold the cogs together so I can isolate and correctly space only the two that I will need. The small one will be needed as well, to mate with the lockring. Because I don't know the history of the flywheel, and critically, because welding the freehub body on will make one bearing inaccessible, I elected to grab new bearings. 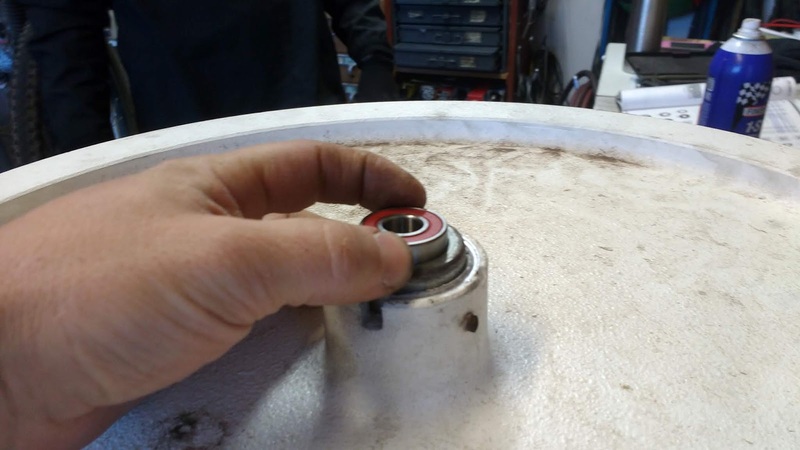 Thankfully the shop had a pair of appropriate 6001 bearings in stock. I thought it was kind of funny that the old bearings were stamped "West Germany"! But one was a little rusty so I think replacing them was a wise decision. I'll be working on this more this week and it sounds like the fab shop should be able to take the shredder next week for all this welding. 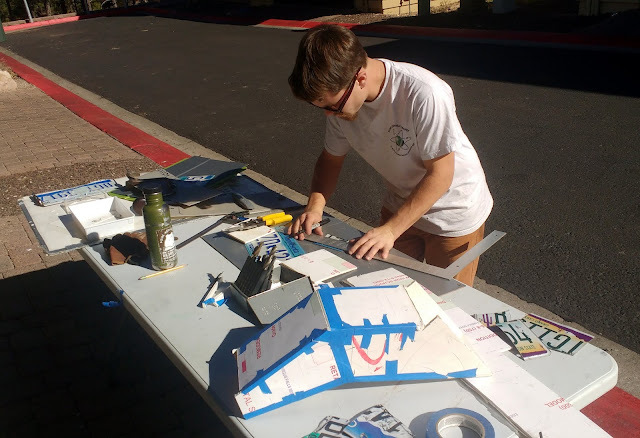 Chute done, shredder promptly broken! I realized I bent part of the blue piece at the wrong point, so I had to drill out a couple rivets and make a new piece out of the green PP sheet. From there on it was cut, bend, rivet. I whizzed through the second half of the chute. Above is my poor man's sheet metal brake. I use the white board on the left to bend things over. It's a bit of trouble to set up but it works. One side on... both sides on... green piece on. Video walk-around including attachment method. It came out pretty well! I started to shred something in celebration and promptly spun the small cog right off the freewheel, making the whole thing unusable! I'll get that fixed after Thanksgiving. Cheers! The previous chute wasn't working for me. 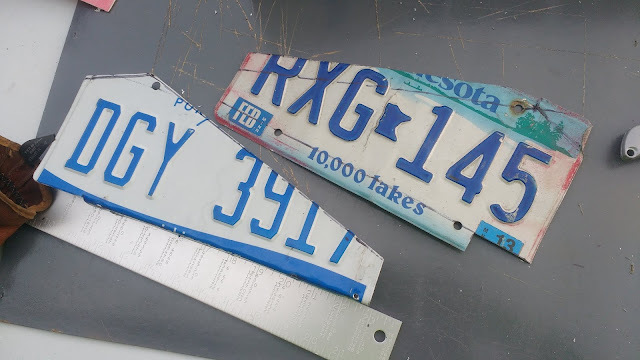 I decided to disassemble it for the license plates and start anew. 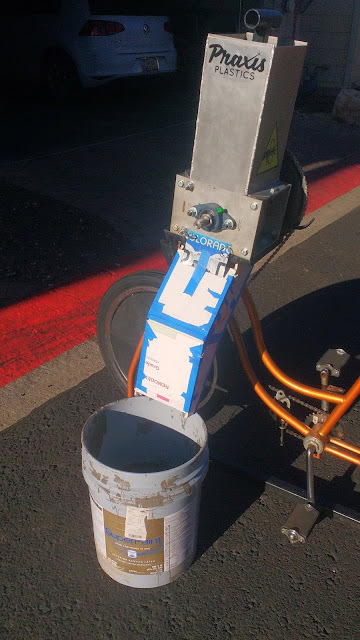 I started with a big sheet of reused foam core and ended up with a two-section chute meant to take the plastic flakes away from my left foot as I pedal, then deposit them into a 5-gallon bucket. 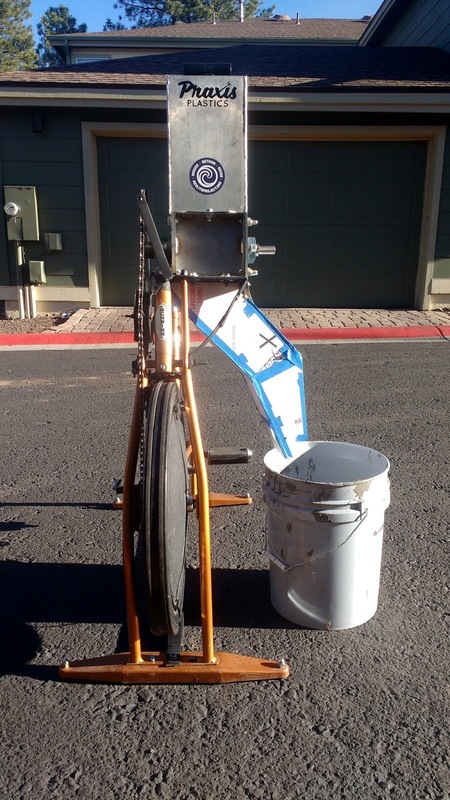 You can see that the chute clears the pedal quite well, and dumps the flakes almost vertically into the bucket. It could probably stick out further, but then I'd run into storage issues. It's probably going to be alright. Of course, to get that C-channel in I opted to remove the shredder for easy access. While it was off I gave the raw steel pieces a quick spray of black paint. You may notice the new chain tensioner up top. I'm converting over to derailleur idlers instead of the plastic bushings. Photo from last night. It may need additional adjustment in the future, but for now I'll see what happens. I deemed it worthy. 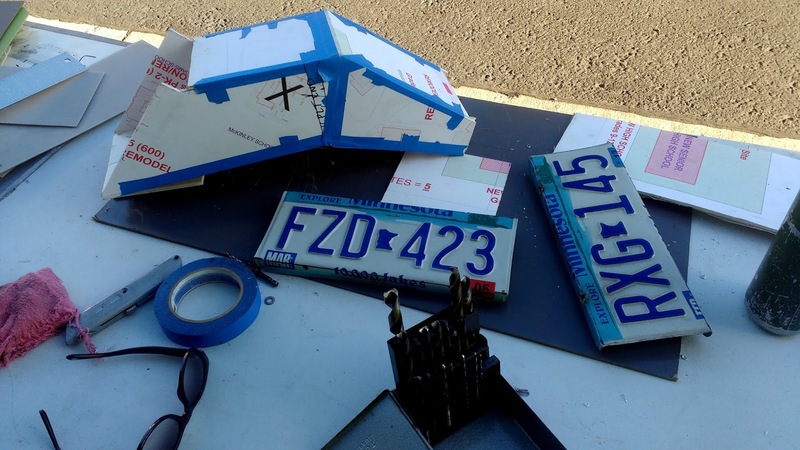 Then I bent up a couple license plates for sides and cut down some polypropylene Sterilite lids for bottoms. I found that these PP sheets are easiest to cut by scoring a straight line then bending the sheet until it snaps. 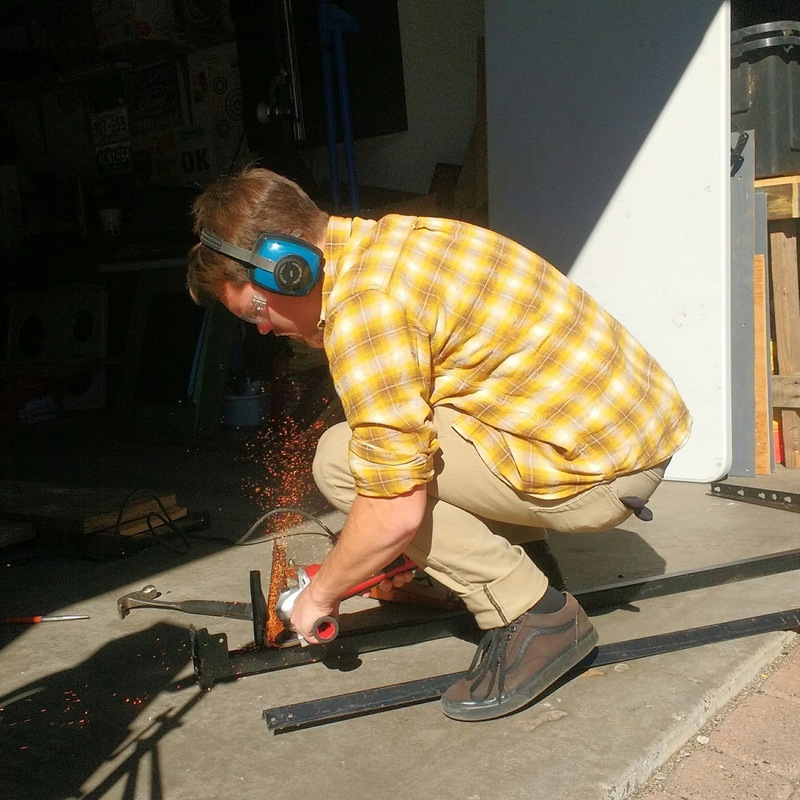 Less trouble than cutting all the way through or using the table saw. I had to buy a new pop rivet tool because my 'vintage' one clogs itself on just about every other rivet. The new one works great and things started to go together quickly. The grey plastic there was bent in a vice. I lightly heated the bend area with a torch and pushed it over with a wide board, just like a rudimentary sheet brake. With the right amount of heating, the plastic sheets hold their shape well. It didn't smell but I would NOT do that without outdoor ventilation. 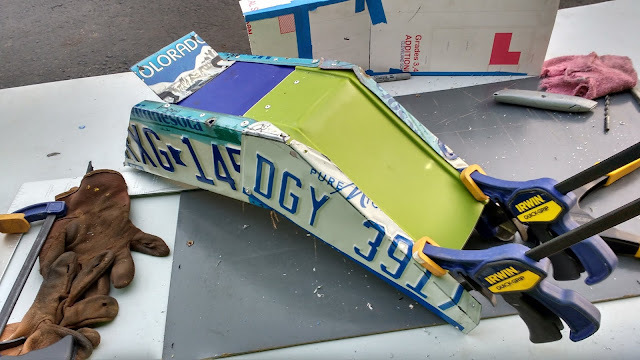 After lots of hours of work, I devised a secure mounting system out of metal scraps and had over half a chute finished. I'll be sure to update with a video when I get it done (hopefully tomorrow). As it is, though, the new chute appears promising, and is made from 100% trash materials (aside from the rivets)! 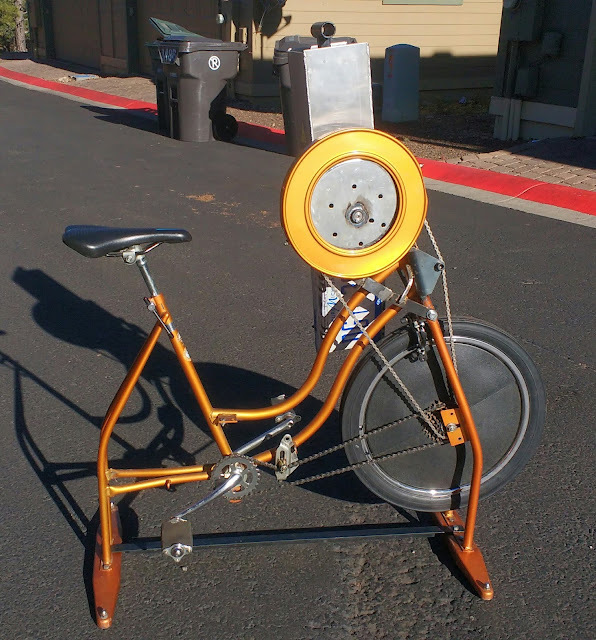 Last, I did lose a little sleep over the flywheel problem and came up with a potential solution. 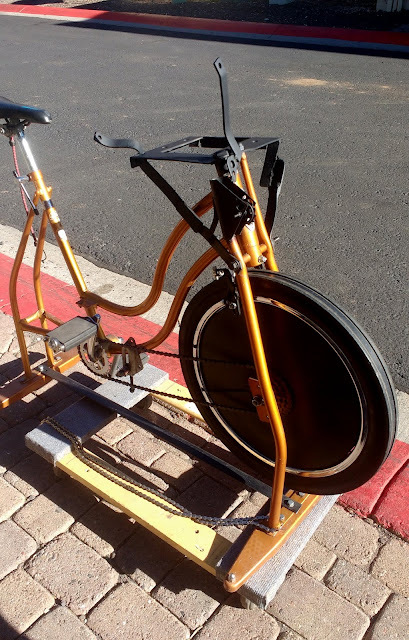 When I got this Schwinn exercise bike for free I was told to also take another one- the owner wanted to get rid of it. 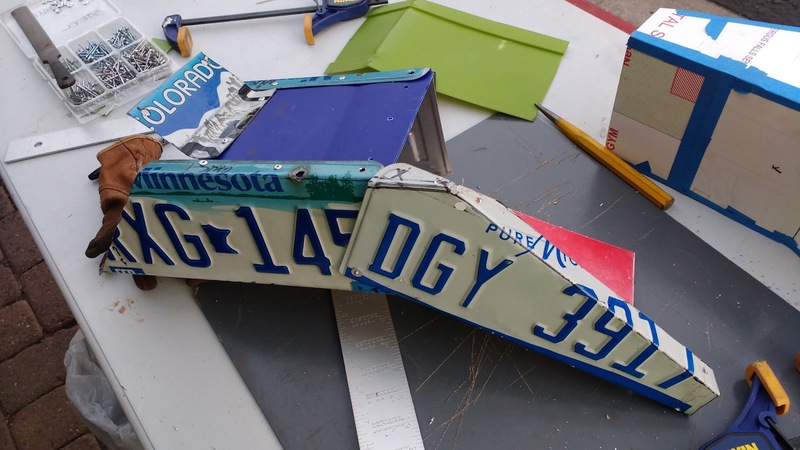 I scavenged a few parts and recycled most of it. One part I kept was its flywheel, which happens to weigh in at about 20 pounds (9 kg). 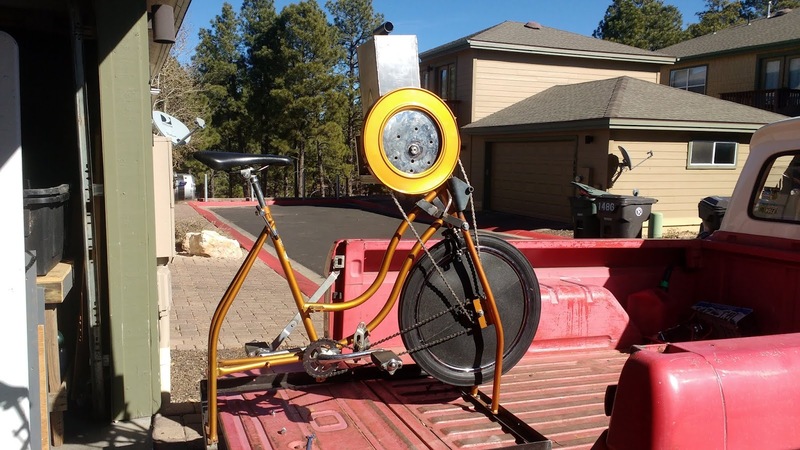 That's almost twice the weight of the Schwinn wheel! 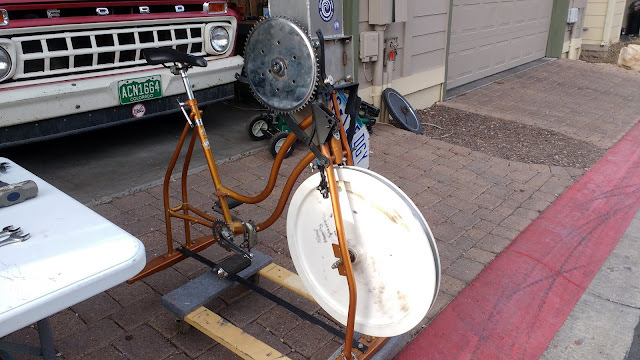 The bike shop is closed starting tomorrow for Thanksgiving, but I'll be taking this wheel in next week to see if we can make the 5 speed freewheel fit. If so, this will give me an instant doubling of flywheel weight, if not energy storage. I plan to have a fab shop add some weights inside the thinner area to get the thing up to 30 or 40 pounds. That's the simplest flywheel solution I can come up with. I'm happy to debut my new logo! Like my machines, it's got a bit of midcentury flair. And of course it does little good beaming with electrons at this site, so I ventured into my university's MakerLab. 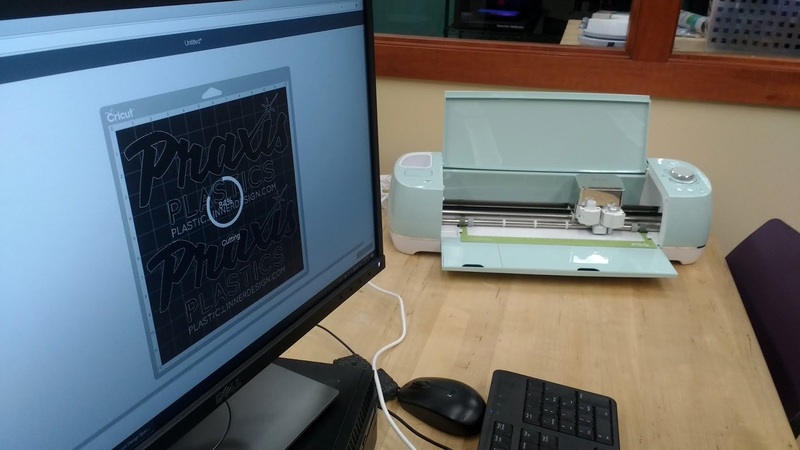 They have everything from a sewing machine to 3D printers, but my eye was on the little Cricut vinyl cutter. It's a very simple process. I made my logo in GIMP (basically a free Photoshop-like software) and brought it to the MakerLab on a flash drive. Then I imported it into the online software, added some vinyl, and boom! New decals. I made a couple white and a few black, in varying sizes. Pretty neat, eh? I think I'll add them to the other sides as well; the goal is to have a logo visible in any photos I or anyone else takes. In other news, I have been looking for a control box for the oven. This is mostly for fire protection if the switches fail, but also cleans up the look a little. I was considering a plastic ammo can I found in the trash months ago, but was warned that a flammable box will not be good at keeping flames in! 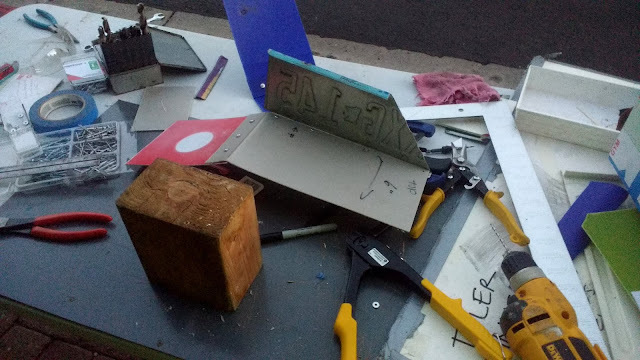 Next idea was to either make one or buy a metal box. 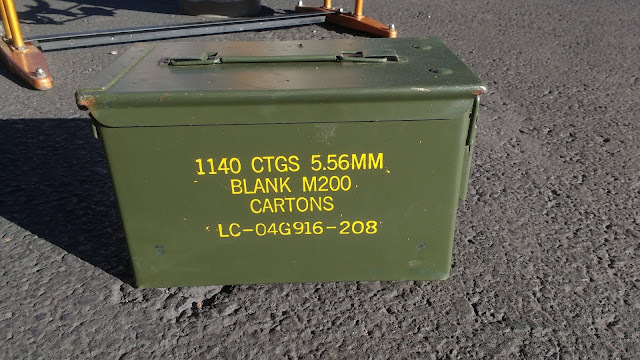 The smallest (.30 cal) ammo box available at the local surplus store was $15- a little higher than I was willing to spend for something that might not fit my temp controller. I was getting ready to build a metal box from scratch when I happened upon a couple pallets full of various ammo boxes at the hardware store. I don't know where they got the things, but I walked out with this adequately sized .50 cal box for $12 plus tax. Not bad. It should work well as a control box and it's hard to deny the cool-factor! Alright! I got the shredder home this past weekend and just got to messing with it. There were a few things that needed tweaking though. The first was that the base turned out a bit larger than I anticipated, so it was going to be hard to fit into the garage. It's a "two car" garage but since it's 2 feet (61 cm) narrower than a standard one, space is tight. 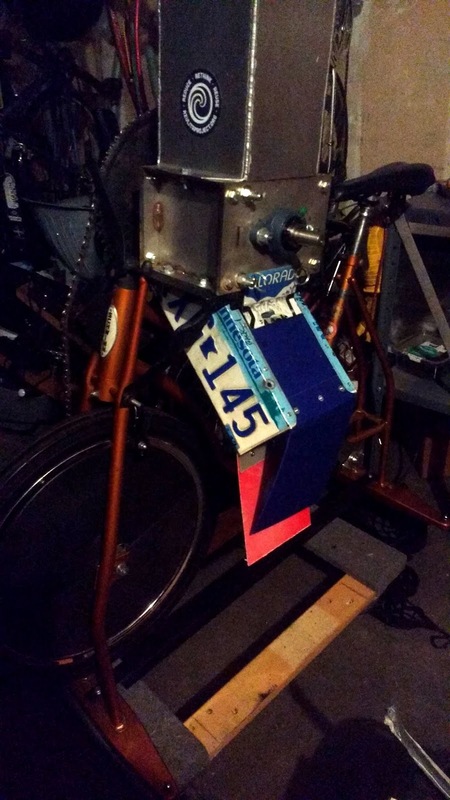 I removed the big box base and reattached the original bases to the bike. The original front to back braces had to be removed to fit the custom drivetrain, so I had to add another brace on the bottom. 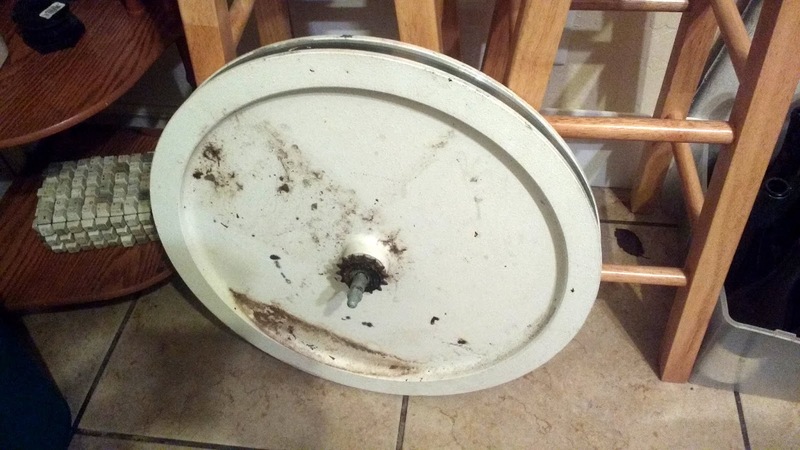 This turned out to be a lightly modified (see below) piece of bed frame angle iron which someone had thrown in the trash. 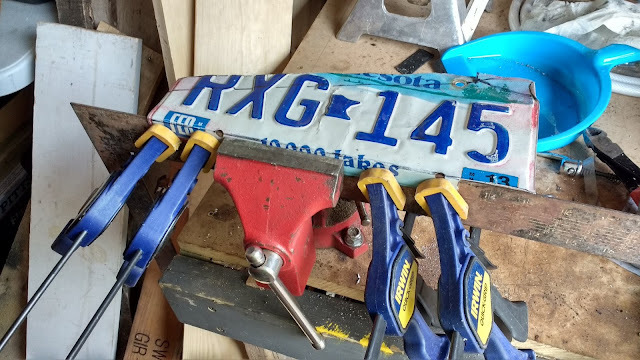 Of course with a hardware store run and the hardness of this steel, the base modification took longer than I'd anticipated. The new/old base can be seen below. 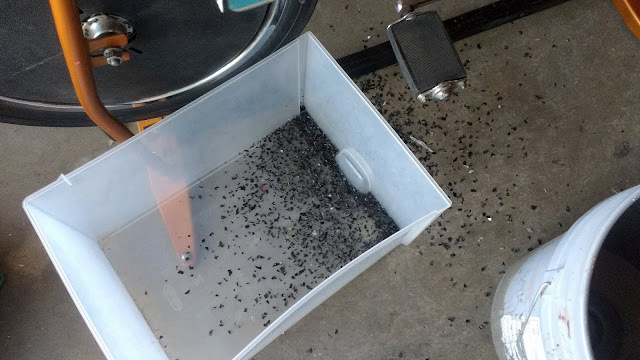 I pulled out a pail from my new stack to test the shredder. Someone had thrown out 15 or so 5-gallon buckets at the recycling center dropoff a while back so I had to grab them for this project. 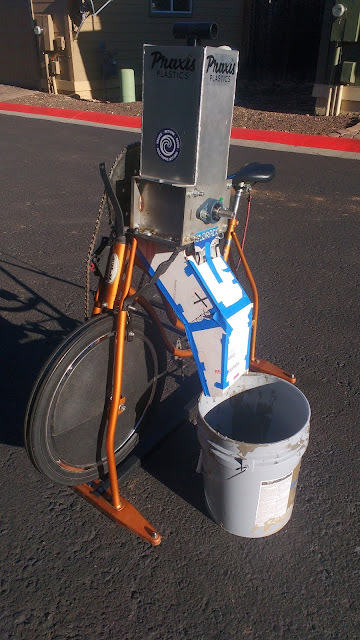 Unfortunately they don't fit in front of the left pedal, so I'll have to extend the chute a bit. A more in-depth video walk-through follows. Click into YouTube for a bigger screen. I took the shredder out of the street to try it out. 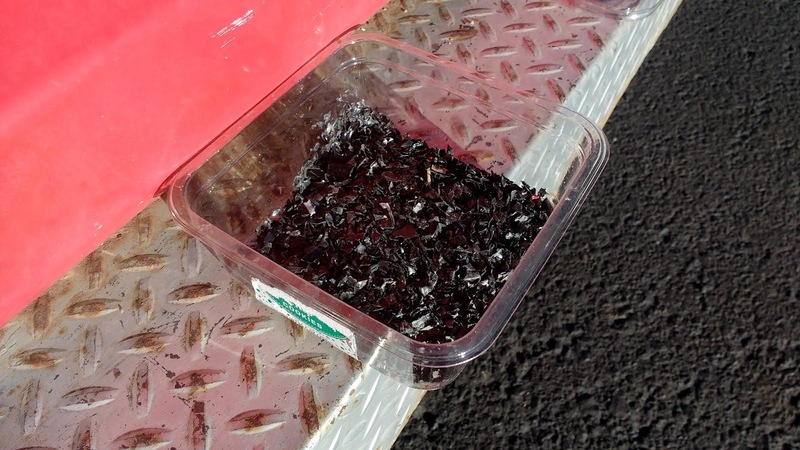 The first test subjects were some black polypropylene (PP) take-out containers. The shredder does shred, but it gets easily hung up. 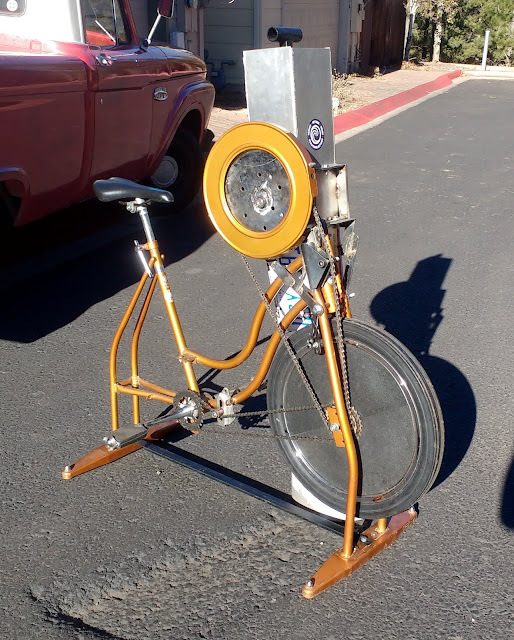 When it gets hung up, the pedals stop abruptly. Regardless, I was able to get through the two containers (one clamshell and one bottom). Since the bucket didn't fit, I tried to catch much of it with a trash PP drawer. It didn't add up to much. 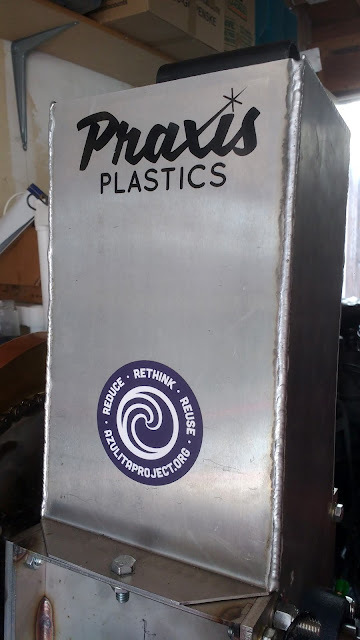 Maybe a cup or two (240-480 mL) of plastic came out. Surely this will melt down much smaller as well. 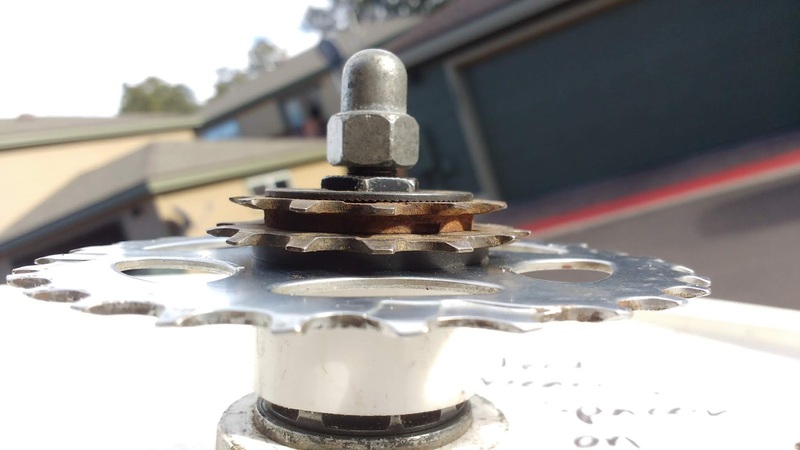 These findings have led me to understand that I need lower gearing to eat through the hard parts as well as a MUCH heavier flywheel to keep the shredder going longer in the face of momentary high resistance. My current one, as you may remember, weighs 10.89 pounds (4.94 kg). I am shooting for 30-40 lbs (14-18 kg). Flywheels basically store up kinetic energy so it can be released later. Treadle sewing machines have flywheels, and so do automotive engines. They basically smooth out variations in power generation and power consumption, making machines more predictable. Here is my inspiration and basis of much of this knowledge. 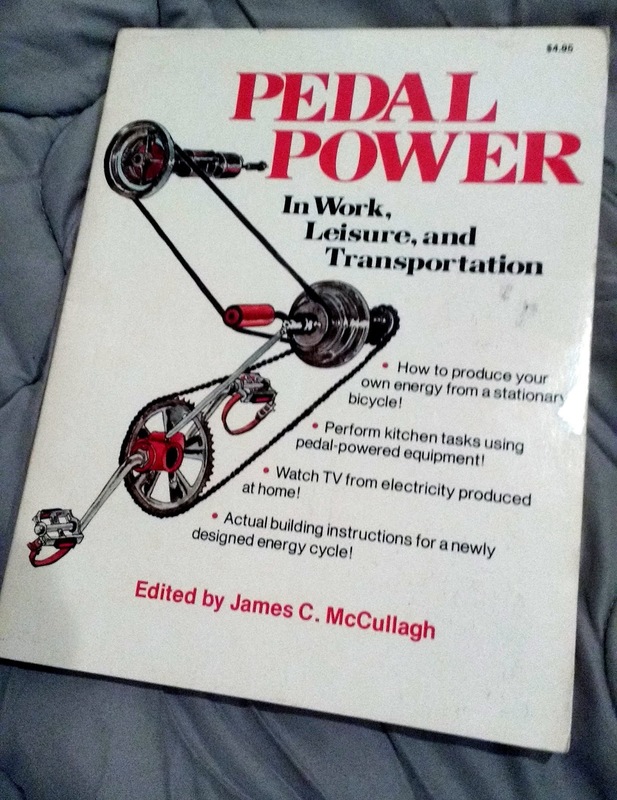 It covers machines from ancient times right up into the 70's bike boom and energy crisis. Very cool information, and much of it gleaned from projects similar to mine. 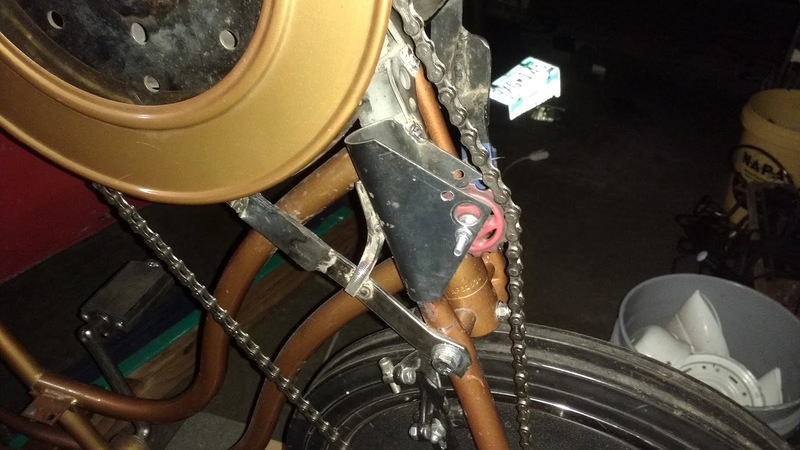 The last thing I did was to try to lower the gearing by moving the chain over to the 28 tooth cog and the lower chain and the 14 tooth on the vertical chain. This will give me that low 4.6:1 ratio- 4.6 revolutions of the cranks to 1 revolution of the shredder. 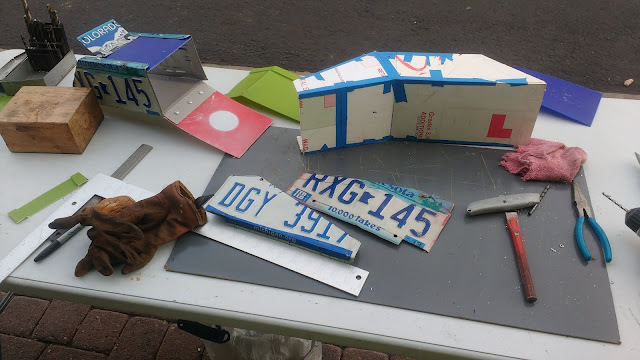 I needed to get a couple parts for that so it's my project for today.